Buckets are a flexible and inexpensive container for the gardener who couldn't otherwise raise vegetables. They are great for limited space, for portability in variable weather conditions, or for people who will do their gardening indoors. They are also a great solution for those who want to raise vegetables year round, giving them a way to control the surrounding conditions along with the cultivation. Buckets are an altogether practical solution for the home vegetable garden. Save money on gardening expenses by planting your vegetables in buckets. You can look for free five-gallon buckets at many restaurants. If you don't have that kind of source, you can find these same buckets very inexpensively at hardware and home improvement stores. You can also use any bucket you have handy, depending upon the size of the plant. Larger plants require bigger buckets, just as they would with any other container. You can also use your buckets for growing your seedlings before it's time to put them outside, which saves on all those many sizes of temporary pots. Ignore harsh growing conditions. Are you concerned about a late frost? Move your bucket garden into sheltered territory or cover it with a blanket. You can move an entire small vegetable garden into your garage in under an hour. You can also grow winter crops indoors in any space that has a window. As long as indoor temperatures don't drop below freezing, you can continue to grow brassicas, peas and many salad crops during the winter. When you pass the last frosts of spring, simply move your buckets outside. 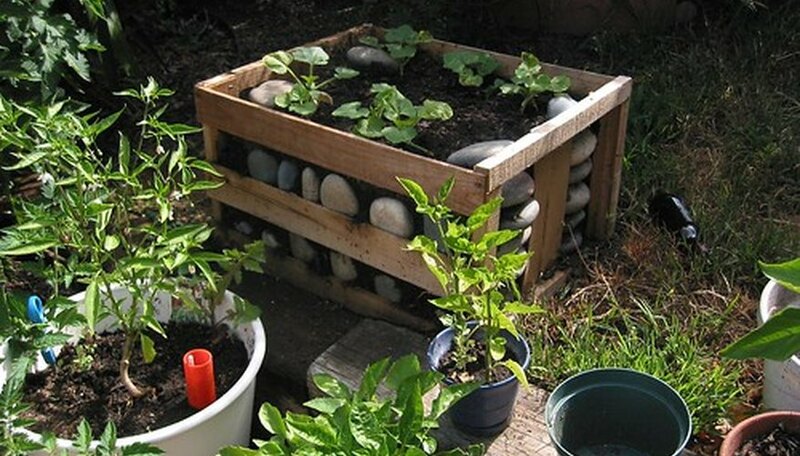 Grow your garden vertically with the help of buckets. Construct brick and board shelves to stack more than one layer in the same space. You can also grow healthy tomatoes, cucumbers, beans or other vining plants by using a tomato cage in each bucket. An additional cage placed on top of the first will extend the reach of your vegetable bucket even farther. Grow crops that must be isolated from each other by planting them in buckets. Have your sweet corn in the backyard in the regular garden and plant popcorn in buckets on the other side of the house. This will ensure no more tough sweet corn or unpoppable popcorn. You can also try breeding a new tomato or other vegetable variety by isolating one plant and pollinating it with a cotton swab. You may end up with a terrific tomato that has never been seen before. Recycle your buckets and your soil at the end of the growing season. Simply empty your buckets in a pile in one spot. then add your soil amendments and compost to the entire pile. Finish by planting a cover crop of buckwheat or soybeans on the mound of soil. Store your buckets over the winter. Turn over your cover crop and put the soil back into your buckets the next year. Drill several 1/4- to 1/2-inch holes in the bottom of your bucket, for drainage. Add an inch of gravel to the bottom. Fill the rest of the bucket with a mix of coarse perlite, compost and peat moss. Plant your seeds or seedlings, then place them in a sunny location. Check for water every other day, more frequently in very hot weather. Save on watering by using a mulch as a top layer on the bucket. Patricia Bryant Resnick started writing when she was 7. She received a Bachelor of Arts from Sonoma State University in 1975. She began writing professionally in 1996 and has been published in "Rolling Stone," "Georgia Family Magazine" and online. Resnick specializes in food and gardening articles; she is a regular reviewer of tea on the Web.